The Toronto Maple Leafs have signed goaltender Garret Sparks to a one-year contract extension. TORONTO — The Toronto Maple Leafs have signed goaltender Garret Sparks to a one-year contract extension. The contract will carry an average annual value of US$750,000 in 2019-20. The 25-year-old native of Elmhurst, Ill., has posted a 7-5-1 record with a 3.09 goals-against average, a .902 save percentage and one shutout in 14 appearances with the Maple Leafs this season. "I won't lie — it's been a tough year," Sparks said Tuesday at the Maple Leafs' practice in Vancouver. "But I think it's made me a better athlete and a better goaltender. I'd rather go through this stuff now than a portion of your career where you're being relied on as a starter. "It's amazing to be able to come here and deal with success and struggle and triumph ultimately. I'm just looking forward to continuing to play this year, get a few more starts and hopefully build something." Sparks said he has learned a lot playing behind Leafs starter Frederik Andersen, who has been one of the NHL's top goalies this season. Andersen has 32 wins, good for a tie with Vegas's Marc-Andre Fleury for the league lead. "When you're young and an impressionable goalie, the goalie that's in front of you, you start to absorb a lot of that. And I'm just fortunate to have him out there and learn from him and watch him on a daily basis," Sparks said. "But at the same time, it makes the comparison that much more challenging. You have to live up to the greatness that he brings every day." 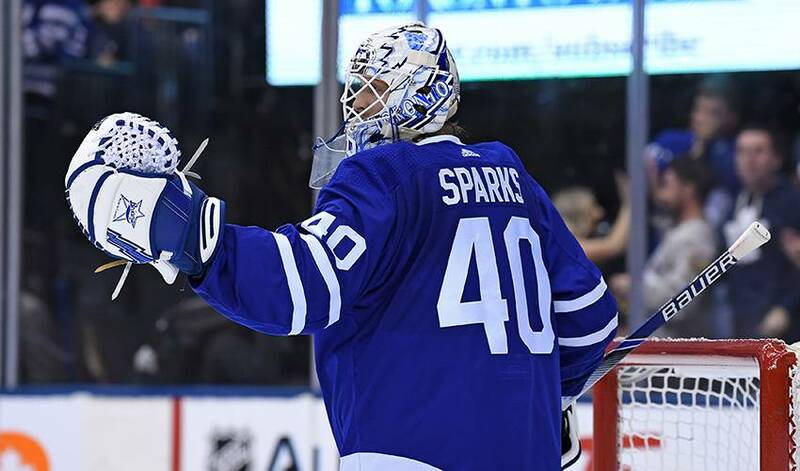 Sparks won the Aldege (Baz) Bastien Memorial Award as the American Hockey League's outstanding goaltender last season after leading the AHL in goals against average (1.79), save percentage (.936) and wins (31) while helping the Toronto Marlies capture the 2018 Calder Cup championship. Sparks was originally selected by Toronto in the seventh round, 189th overall, of the 2011 NHL draft. "He's just got to grow his craft. That's the biggest thing," Leafs had coach Mike Babcock said. "Every day they let you stay in the league's a good day and you just keep improving and if you improve enough, you get to stay for a long time. It's evident when you look around the league, it's hard to be a goaltender in the NHL, it's hard to be a good one. So his priorities are just keep working, build his skill base so he becomes a real good goaltender." — With files from Gemma Karstens-Smith in Vancouver. Even when he wasn’t playing hockey, Auston Matthews still found a way to turn heads. You already know his favourite NHL jersey growing up, but the reason he sports No. 91, his alternate career path, and more in this week's Player Q&A! It was a grand gesture delivered in a most humble way. And just exactly what you would expect from Zach Hyman. His favourite cheat meal, social account to follow, and more in this week's Player Q&A with No. 34 for the Toronto Maple Leafs!